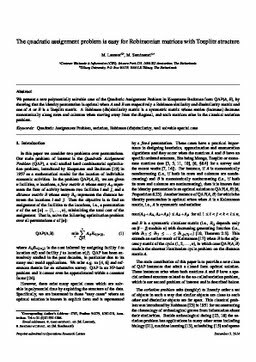 We present a new polynomially solvable case of the Quadratic Assignment Problem in Koopmans-Beckman form QAP(A,B), by showing that the identity permutation is optimal when A and B are respectively a Robinson similarity and dissimilarity matrix and one of A or B is a Toeplitz matrix. A Robinson (dis)similarity matrix is a symmetric matrix whose entries (increase) decrease monotonically along rows and columns when moving away from the diagonal, and such matrices arise in the classical seriation problem. Laurent, M, & Seminaroti, M. (2014). The quadratic assignment problem is easy for Robinsonian matrices with Toeplitz structure. Operations Research Letters, available onlin(18 December 2014).